Consumption: Refers primarily to tuberculosis (TB)and generically to any wasting away of the body. There was no true cure for tuberculosis in the nineteenth centruy. Patients were often commited to sanatoriums where fresh air and healthy food were felt to be beneficial. Late in the century, artificial or surgical collapse of a lung provided some releif. We now know that TB is caused by the bacteria Mycobacterium tuberculosis. Treatment consists of 6 to 9 months, sometimes longer, of a regimen of one or several antibiotics in combination. Resistent strains have developed which are difficult to treat and a real cause for concern. 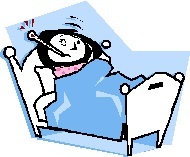 La Grippe: Influenza. The horrific influenza epidemics of the past are well documented. Hundreds of thousands of people died of the disease. Indeed, the outbreak of influenza is still feared today. In the nineteenth century, the treatment for influenza was little more than a huge dose of hope. Today we know influenza is caused by viruses which change constantly, hence the yearly flu vaccine. Once the flu develops, supportive measures are effective. Anti-viral medications are also available to use in select cases. Next time: Catarrah, Ague, Blood Poisoning and "The Pox"